The main objective of the internship program is to fill the gap between theoretical knowledge and practical experience. This report contains two phases. In the first phase, there is a brief discussion on the Standard Chartered Bank as an organization and the functions of the Cash Management Operations department. Though I was an intern in Inward Remittance unit under CMO, my report tries to discover the functions of ITT unit. On the second phase, there is a short discussion on other units of Cash Management Operations and also tried to relate with HRM functions. Then I also tried to do SWOT analysis in my justification. All the data were firstly processed and then the salvaged information was interpreted and the overall performance was analyzed seemingly. Thus, as a result of my study some rigorous suggestions and recommendations are stated in the last portion of my report. This is a reflection of academic knowledge through practical work experience which is almost mandatory for the successful completion of BRAC Business School (BBS) degree. The report has been prepared as requirement of BBS program after the completion of 3 months (16th March- 15th June, 2015) organizational attachment at Standard Chartered Bank. I did my internship in Inward Remittance (ITT) under the department of Cash Management Operations (CMO) of SCB. 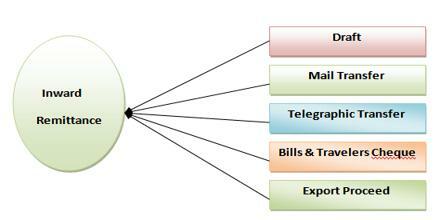 “Functions of Inward Remittance unit under CMO and relate it to HRM functions”. General Objective: To present the “Functions of Inward Remittance and relate it to HRM functions”. To know about the Cash Management Operations of SCB. To relate the functions of ITT with HRM. To suggest some recommendations on the basis of findings. Every day billions of transactions are made around the world. So, there is no matter to surprise that Cash Management is an incredibly important area for banks. Cash management is evolving local and cross border payments, collections, information management, account services, liquidity management and investment services for both corporate and institutional clients. To reach a high volume of financial profit SCB looking for different procedures of customer payments. Through which they can provide the customer best service and also transfer or pay the money as quick as possible. They use lots of technology and a worldwide system for making the transaction and keeping of data. This sector also involves optimizing the way it makes internal and external payments, and making the best use of internal liquidity (cash owned by the company) to reduce the need for external loans. It can be said that this report is also important for SCB because, by this report it will create awareness among the employees and customers about the present payment procedures. It will also help them to improve their services and also find faults and remove those errors. If I am working on this topic it will also help me to know more about cash management system of this bank. Standard Chartered Bank has been operating in Bangladesh for more than 100 years. Having being established in British colonial period, the bank has positioned itself as a unique business serving the local business community with due professional and ethical fervor. The Standard Chartered Group was formed in 1969 through a merger of two banks: The Standard Bank of British South Africa founded in 1863, and the Chartered Bank of India, Australia and China, founded in 1853. This friendly merger allowed both banks to capitalize on the expansion of trade caused by the increased movement of goods from Europe to the East and Africa. In 1969, the decision was made by Chartered and by Standard to undergo a friendly merger .In 1986 an aggressive takeover bid was made for the Group by Lloyds Bank of the United Kingdom. When the bid was defeated, Standard Chartered entered a period of change. Provisions had to be made against third world debt exposure and loans to corporations and entrepreneurs who could not meet their commitments. Standard Chartered began a series of divestments notably in the United States and South Africa, and also entered into a number of asset sales. Since the early 90s, Standard Chartered has focused on developing its strong franchises in Asia, Africa and the Middle East, using its operations in the United Kingdom and North America to provide customers with a bridge between these markets. They have also focused on consumer, corporate and institutional banking, as well as the provision of treasury services – areas in which the Group has particular strength and expertise. In the new millennium we acquired Grind lays Bank from the ANZ Group and the Chase Consumer Banking operations in Hong Kong in 2000. Since 2005, we have achieved several milestones with a number of strategic alliances and acquisitions that will extend our client and geographic reach and enhance our capabilities. Some of them include A Brain, American Express Bank, Cazenovia Asia, Harrison Love grove and Pembroke. In 1957 Chartered Bank bought the Eastern Bank together with the Ionian Bank‟s Cyprus Branches. This established a presence in the Gulf. In Bangladesh the number of banks in all now stands at 52, among them Standard Chartered Bank (SCB) is the leading multinational bank. Standard Chartered Bangladesh, officially M/S Standard Chartered Bank Bangladesh Pvt. Ltd. is a banking and financial services company headquartered in Dhaka, Bangladesh and a wholly owned subsidiary of Standard Chartered. Standard Chartered Bank originally established its first branch in Chittagong in 1948 after the partition of the subcontinent in 1947 where East Pakistan became Bangladesh. The Chartered Bank started operating in Bangladesh in 1948, opening a branch in Chittagong. The branch was opened mainly to facilitate the post-war re-establishment and expansion of South and Southeast Asia. The Chartered Bank opened another branch in Dhaka in 1966, where it is still headquartered. After the merger of the Chartered Bank with the Standard Bank in 1969, the Standard Chartered Bank took up a program of expansion. It increasingly invested in people; technology and premises as its business grew in relation to the country’s economy. The acquisitions of Grind lays bank (in 2000) and the commercial banking business of American Express Bank in Bangladesh (in 2006) are reflections of the Bank‟s increasing commitment to Bangladesh. The bank increasingly invested in people, technology and premises as its business grew in relation to the country’s thriving economy. This bank is only the country’s only offshore banking units inside Dhaka Export Processing Zone (DEPZ) at Savar and Chittagong Export Processing Zone (CEPZ). This is only bank that never closed its doors over 100 years of banking operation in the country. Today, Standard Chartered Bank is the largest international bank in Bangladesh with 26 Branches, 57 ATMs and 7 Financial Booths; employing over 1,300 people. They are the only foreign bank in the country with presence in 6 cities of Bangladesh, They are: Dhaka, Chittagong, Khulna, Sylhet, Bogra and Narayanganj. 10 Branches in Dhaka city. 1 Branch in Savar EPZ (recently started with full banking operations). They currently provide both Consumer Banking and Wholesale Banking Services, ranging from Personal and Corporate Banking to Institutional Banking, Treasury and Custodial services. Extensive knowledge of the market and essential expertise in a wide range of financial services underline their strength to build business opportunities for corporate and institutional clients in Bangladesh. Continuous upgrading of technology and control systems has enabled the bank to offer new and improved services such as Phone banking, I-banking, E-Lending. The vision of Standard Chartered Bank is to make it an experience, which satisfy the customer and an environment where the people like to stand out. This bank has achieved a positive slot in the hearts of Bangladeshi people for its long-standing service and quality. Being courageous is about confidently doing what is right. Often the task may seem insurmountable but with courage and tenacity, the odds can be overcome. A truly courageous act both inspires and builds character. How SCB responds to customers and how it will influence customer‟s belief in their commitment towards them. A proactive response is often unexpected and more effective in such case. It clearly demonstrates organization‟s willingness to go beyond the unexpected. As a member of global village SCB views the world from the widest perspective. They consider themselves to be global citizens and the world is full of new opportunities and exciting possibilities. SCB also delivers world-class products and services. Creativity belongs to those who are excited by challenges and engage themselves in fresh thinking and an open mindedness. Creative thinkers are not limited by convention but are those allow their minds to soar beyond predictable solutions. SCB believes that they are a creative organization as well. Trust is the foundation of every successful relationship. SCB trusts because the organization believes in the sincerity of their promise. They also believe that building trust can take forever, but losing it takes only a moment. It has the widest distribution network among foreign banks through its own branches and correspondent banks. Cash Management services include local and cross border payments, collections, information management and investment services for both corporate and institutional clients. As part of Standard Charterer‟s global transaction solutions to Corporate and Institutions, they provide Cash Management, Securities Services and Trade Services through their strong market networks in Asia, Africa, the Middle East and Latin America. SCB also provide a connection to these markets for clients from the U.S and Europe. They also ensure a full suite of transactional products. Banking Experience for more than 110 years. SCB has wide range of customer base and its operating efficiently in this country. SCB is the first bank in Bangladesh to issue Money link (ATM) card. SCB has fewer branches than their competitor. SCB has more and high fees and charges compared to its rivals. SCB hasn‟t that much good market share as other multinational bank. As SCB‟s marketing strategy is not aggressive. The country‟s growing population is gradually and increasingly learning to adapt consumer finance. Increased competition by other foreign banks. At present HSBC and CITI Corp are posing significant threats to SCB regarding retail and business banking respectively. The new comers in private sector- Prime Bank, Dutch Bangla Bank, EXIM Bank, BRAC Bank are also coming up with very competitive products. Inward telegraphic Transfer (ITT) department is for foreign currency transfer and convert that into local currency. My supervisor was Md. Nadeem. He taught me how to receive messages, sort out them for pre-advice. Banks receive numerous requests from customers asking them to credit and place funds from one place to another. The Society for Worldwide Interbank Financial Telecommunication (SWIFT) provides secure global financial messaging services and places an obligation on members to ensure that there is strict compliance with settlement instructions in messages. Therefore we have to process settlements according to the message without deviating from its contents. Inward Telegraphic Transfer (ITT) is a receipt of funds by SWIFT/Telex from an overseas party. DBS Bank has a very extensive network of correspondent banks and overseas branches. As such, you can receive funds in various currencies from most parts of the world. If the messages received from other banks with old value date can be processed on current date based on cover credit. Current and forward value date messages should be kept in the pending file to process on future date based on cover credit. Attach the filled in Form C with the respective message and verify whether the declaration on Form C and supporting document (if provided any) is sufficient to effect the transaction considering the Remitter, Beneficiary and other details. In addition to that, for the following purposes, processor will require to obtain and check some special/relevant approvals before effecting the payment. Commission /Office Expense: It checks in the file provided by Account Services whether beneficiary is holding the valid permission against the Remitter. Receive ITT instruction via SWIFT in MT103,202,101 formats. Generate pre-advice and inform customer about remittance and receive supporting documents from customer for the payments. If necessary documents are not been provided or required documents are not updated then items move to UCD (Unclaimed Cover for Drawings) file, and hold the remittance for regulatory requirement. Rewarding system: There is no rewarding system in inward remittance for the employees as the reward is given in a year only which is called yearly bonus. A good amount of money based on performance will be given yearly to the employees. Except this there is no rewarding system. Compensation: Standard Chartered bank follows a pay scale system where employees are counted from 10th grade to 1st grade. When an officer join as a 10th grade officer he/she will get a fixed salary along with some allowances as house rent and medical expenses. Officers need to work there at least for two years to get another promotion from grade 10. Whenever they get promotion allowances will also increase along with some other benefits. Before two years no one can get promotion. Motivation: Like other organization SCB won‟t do anything to motivate its employees. Other organizations may give double salary or give increment for good performance but SCB doesn‟t do that. Senior managers only give a pat on the back of the employees to appreciate their works. Another thing is, head of the department try to celebrate employee‟s birthday by giving bouquet to cheer them up. Except this I couldn‟t see any motivation among the employees. Lack of motivation can be a danger to and organization. Outward Telegraphic Transfer (OTT): OTT unit processes outward remittances where fund is transferred from accounts held with SCB Bangladesh. Though the telegraphic system has been decommissioned for such transfers, the term „telegraphic transfer‟ broadly is being used throughout the banking industry. OTT itself makes 2 reports for BB-TM reporting and Cash- Flow reporting. TM reporting involves sending the original TM form along with photocopies of all relevant documents of tax. Cash flow reporting involves sending a weekly report of exact amount of transactions passed through by SCB OTT. Foreign Collection Unit (FCU): Foreign Collection Unit also works under cash management operations department. The foreign collection unit collects foreign currency from both local and foreign bank on behalf of SCB clients. Bills Pay: Bills pay, the most convenient way to settle monthly utility bills. Bills pay unit not only provide convenience but also allow flexibility to pay customer bills as and when chosen. Once who sign up for the services, customer will no longer have to go out of his way to pay bills for electricity, mobile phones, internet, etc., every month. Bills pay provides one-stop payment solution where the department will debit customers‟ account to pay bills. CAAR: The main responsibility of commercial and airlines remittance unit is to determine the surplus earnings of the airlines and shipping companies which are the remaining earning they have left after all taxes and other payments have been settled in their home countries. This surplus earning is the remittable amount. The airlines send their collection and disbursement statements to CAAR every month, while the shipping companies send theirs every quarter. CAAR cross matches the remit able amount shown by the companies with the internal checking and calculation. Then CAAR forward a remittance application from with other documents obtained from the customer to OTT. If OTT finds the instructions complying they remit the proceeds to the parent company. Online: which do not have direct landing in Bangladesh rather they have agents to sell the tickets. Offline: Have their flights land in the territory of Bangladesh. At first, I am highly grateful to Al-Mighty Allah, who has provided me with all kinds of opportunities to complete the internship program. Then I would also like to thank my bank‟s supervisor Mr. Nadeem who has made valuable contribution to my internship program. My bank‟s supervisor appointed me a variety of tasks in order to build my skill in my bank field. Some tasks were very interesting and some were very hard. But he made me able to do any type of work in any situation. From this internship period, I learned a lot of things to improve myself and also increase my confidence. I learned how to do inquiry for all transactions. At first, I am highly grateful to Al-Mighty Allah, who has provided me with all kinds of opportunities to complete the internship program. The Almighty Allah who has enabled me to complete this report. Individual efforts alone can never contribute in totality to a successful completion of any venture. I would like to thank my university allow for doing my internship so that I can complete my BBA program. I would also like to thank my supervisor Md. Fazla Mohiuddin who has made valuable contribution toward this report. Analysis part is the main part of any report. In this report two types of analysis have been done. This analysis will define the overall condition of ITT Unit of Cash Management Operation. 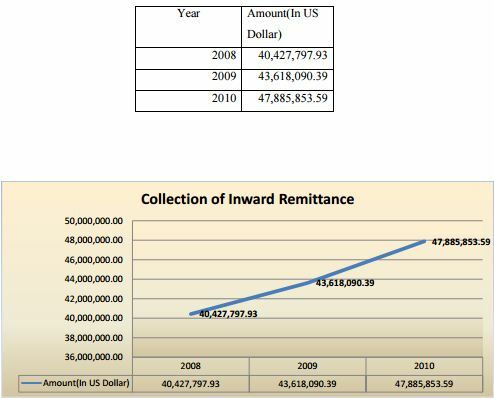 The above Trend analysis is showing the total amount of remittance received in 2008, 2009 and 2010 in US dollar. Here we can see that, the amounts of inward remittances are gradually increased by year. Here above Pie chart shows the percentage of purposes of inward remittance received on the basis of year 2014. 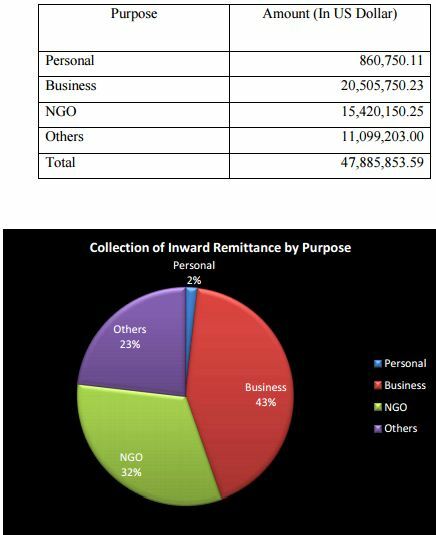 From the business purpose 43% remittances are received which is maximum among others then remittance come from NGO, Other and Personal purposes accordingly. There is a large amount of contract workers in SCB. They always feel insecure about their job. They tried their best to be permanent but not all of them can do it. Remuneration Package for entry level officers is very low in SCB. That is another weakness of SCB. They offer very low amount salary to their officers. That‟s why switching rate of SCB is high. Now a day, competition is increasing day by day. In this competitive environment local banks are offering standardized product by using new technology. They also offer handsome salary to the new employees. For this reason, SCB facing new challenge to maintain their standard and their customers. SCB is one of the market leaders and has long standing presence in the banking industry in Bangladesh and its portfolio includes the biggest names. It has the widest distribution network among foreign banks present in our country through its own branches and correspondent banks. For customers added convenience SCB has an enquiry processing service which enables them to respond quickly to customer‟s needs. In SCB account opening and maintenance cost is very high. It is not possible for all to maintain these costs according to the economic condition of our country. For this reason, very little amount of Accounts is maintained till the end. As SCB has lots of contract employee which is not so good for them. They should permanent their worker after a certain time. They can also permanent their worker on the basis of their performance. Remuneration Package for entry level officers is very low in SCB.. They offer very low amount salary to their officers. That‟s why switching rate of SCB is high. So they should offer average or high salary for their officers. In SCB account opening and maintenance cost is very high. It is not possible for all to maintain these costs according to the economic condition of our country. For this reason, very little amount of Accounts is maintained till the end. They can offer low charge on account opening and their maintenance cost. So that customers can maintain their account till the end. SCB has low amount of ATM booths than other banks. That‟s why, sometimes customer have to face trouble for withdrawn their money on their urgent time. So they need to increase the number of their ATM booths inside and outside of Dhaka. In compare to collection of remittance SCB was lack behind HSBC bank. So, they have to increase their position from this to be the leading bank because HSBC is the number one competitor of them. The cash management operations department must evaluate employees‟ performance and based on that, the department must allow promotion to appreciate. It is important to promote every department‟s employee time to time. Because all departments employees are important part of the organization. As Standard Chartered Bank playing corporative social responsibilities they also should invest in the government sector for the development of the country. Finally, SCB BD should try to defuse the threats, overcome the weakness and exploit the opportunities maintaining its strength. In spite of facing some internal and external problem, SCB is continuously providing services to the large number of customers. To operate more efficiently, they are taking necessary steps to overcome all of these problems. In this regards SCB maintains good relationship between management and officials, making good communication with local groups and governments and collecting proper information about the market competitors. Standard Chartered Group has earned the reputation of top foreign banks operating in Bangladesh. The organization is much more structured compared to any other foreign bank operating in Bangladesh. It is relentless in pursuit of business innovation and improvement. It has a reputation as a leader in financing manufacturing sector. Certainly with a banking heritage spanning more than 150 years, Standard Chartered has an extensive global reach and a strong position in emerging markets, supplemented by strategic alliances and acquisitions. SCB is not only the leading foreign bank but also one of the few banks that have revolutionized the banking service industry through adoption of modern technology and process with a view to enhancing customer satisfaction. Though standard chartered bank has been operating around the globe with a strong brand image “Here for Good” and customer satisfaction but it‟s still need to improve some of its lacking to enrich and maintain a better reputation to become the world‟s best international bank. This report tries to figure out most of the indicators of problems and strengths of Standard Chartered Bank as a foreign bank in the competitive banking sector of Bangladesh. Competition is going on currently in this sector and that‟s why Standard Chartered Bank has to work out with different dimensions like – product diversification, market forecasting, proactive activities undertaken by Standard Chartered Bank and some suggestion to get rid of the predicaments that exist.